The week of Christmas, 2007, I learned an essential truth about myself. I am born with invention and discovery in my pedigree. 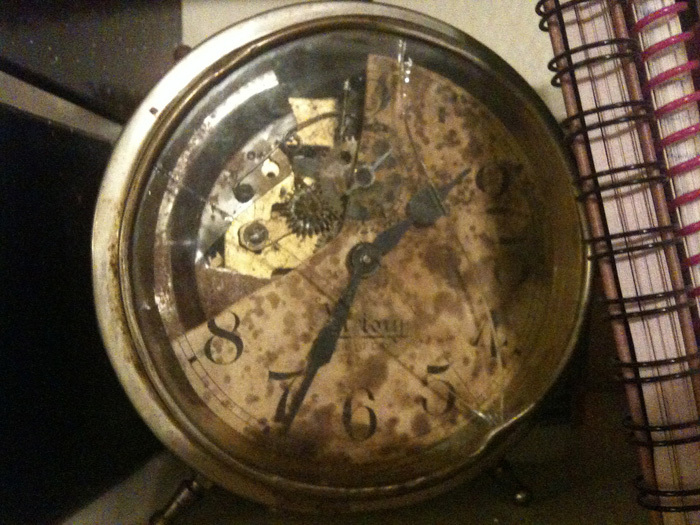 I was sitting in my parents’ new house holding a small, silver alarm clock pitted with little dents and patina. Picture the stereotypical alarm clock — round face, stubby little peg feet, big bells on top with a clapper in between them and a little lever for bypassing the clockwork to both silence and reset the alarm. Nothing remarkable about that, right? You can still find them for about $15 at Target. What makes that little clock remarkable is that according to my dad, it’s the first one of its kind. You see, his grandfather, my great-grandfather, was an inventor. Or I should say, he was a tinker. He didn’t make his living at dreaming up new gadgetry, but from time to time he’d improve upon the things he had around him. According to the family lore (the clock itself being pretty solid evidence of this), Great Grandpa Hyde invented the bypass lever mechanism for the modern mechanical alarm clock. Previously, when the alarm woke you in the morning, you had to first shut it off, then re-wind the whole clock. His bypass lever allowed one to simply shut off the alarm and let the clock keep running. A simple innovation, but fairly profound to how the world came to use alarm clocks. He submitted his idea to one of the major clock companies, who rejected him saying that they didn’t see much merit in his innovation. The following year, their newest model alarm clock featured a handy new bypass lever. GG Hyde was neither credited nor compensated. A similar thing happened to him again with Chrysler and an idea he submitted for what became the modern automatic transmission. I’ve seen his dated sketches for what we know today as a torque converter. Chances are you’ve got one in your car. As discouraging as those stories are in how they turned out, seeing that kind of inventing happening three generations ago in my family was simply thrilling. I think of that man’s daughter — my dad’s aunt Mary Jane — who flew fighters during WWII as part of the W.A.S.P. program and later helped design the landing radar on the Apollo lunar lander. I geek out to no end thinking that some of our family tech is sitting on the moon! Her brother worked on both the XB-70 and B1-A supersonic strategic bomber programs, and later for Lockheed’s Skunkworks devision on projects he probably still can’t talk about. Then there’s dad. If I had to pick just one thing I appreciate most about my upbringing, it’d be the industriousness that he modeled for me. Dad was never really one to wait for the market to provide him with whatever he wanted or needed. He also didn’t see the need to pay the market’s prices for things he could just assume do or build himself. What’s more, he’s never been one to shy away from something he wanted to do simply because it was difficult. Take for example his 1969 MGb GT. Dad bought the car new in 1969 and has had it ever since. Keeping an old british car running is no small feat. It’s no garage queen either. He drove that little green car to work every day until he retired. He restored the interior when I was a teenager and now it’s essentially due for another restoration. This time it’ll include the motor and the bodywork. Thanks to dad, I know how to use tools. I know how not to break the heads off of bolts. I know how to read factory service manuals. This kind of hands-on learning was invaluable, and not always voluntary. I was the default tool fetcher whenever dad was working on something, especially cars. What I didn’t appreciate for many years was the invaluable mentorship I was receiving. I would have rather been inside watching TV on a Sunday afternoon, but instead I was handing him wrenches and finding his hacksaw in the jumble of the tool room. It wasn’t my favorite thing, mostly because I didn’t understand what he was doing and because I’m lousy at finding things. But in my teen years, a switch flipped in my head. I realized that knowing how to take things apart wasn’t simply good diversion, but would open up whole worlds for me. I realized that knowing how to work on a car was the best gateway to owning one. When that day came, my new wheels needed the air conditioning system rebuilt. A family friend asked where we were going to take the car to in order to get it fixed. Dad just chuckled. “Oh no, no. It’s not going anywhere. He’s going to learn air conditioning.” And learn air conditioning I did. I pulled and replaced every major component in that system. We borrowed a vacuum pump and gauges, charged the system, and I had cool air in my cool car. But more than that, I now understood how a/c systems worked even knew how to convert and old R-12 freon system to R-134a. Useful stuff that’s saved me hundreds of dollars over the years. But more importantly, it’s removed the intimidation factor from a lot of big jobs like that. It took me a solid week to do it. Probably about 30 hours of work. Aside from learning to fix things, dad often modeled ingenious invention — no surprise, growing up in his grandfather’s house. If something he wanted or needed wasn’t readily available or cost more than he thought it ought to, he’d just make his own. He wanted a “chuck wagon” trailer he could haul around behind our van as a mobile kitchen for camping trips and other utility. So he scrounged up an old truck axle, some angle iron and a hitch receiver and welded one up. He wanted a little portable camping griddle that would run off a bottle of propane. So he made one using scrounged parts repurposed so well you’d think this was their original purpose. But what separates his builds from redneck, jury-rigged make-do items is that these things aren’t just slopped together. They’re safe. They’re solid. They’ll work perfectly fine 30 years from now. He’s just finished building a barn at the house. It’ll be a place to park his truck, but more than that, it’ll be “the workshop I always wanted” according to him. No telling what he’ll build with that kind of facility available to him. Which brings me to my current undertaking, Project Streetliner. In a tradition that goes back generations in my family, I’m building the thing I want but can’t find and can’t afford in the marketplace. I want to do very much what’s been described in the latest Porsche Panamera commercial. Over 60 years ago Dr. Ferry Porsche couldn’t find the car of his dreams. So he built one. Now my dream car and Dr. Porsche’s are not that similar — at least not for this vehicle — but the sentiment is the same. I want an interesting, efficient, A-to-B vehicle unlike anything else on the road, and I’m going to have to make it myself. There’s lots of precedent for this — for going one’s own way to have what you want. Mr. Ferrari wanted to race. Mr. Lamborghini thought Mr. Ferarri’s road cars were awful and that he could do much better. Orville and Wilber Wright wanted to fly. Burt Munro wanted to go really, really fast on his Indian motorcycle. Steve Jobs and The Woz wanted to make a computer you could use at home. What I find kind of sad is that we’re currently socialized to find this kind of thinking very “out there” and even dangerous. It doesn’t even occur to most people that they could build their own car, or their own airplane, or their own computer. Yet these things are not as out of reach as many people probably believe. Did you know that there’s an immense grassroots organization, the EAA, devoted entirely to homebuilt aircraft? Across the country, right now, there are literally thousands of people with actual aircraft in their garages in various stages of completion. There are tens if not hundreds of thousands of operational homebuilt aircraft flying around the world every day. That rules! I want to tap into that ethos. I want to connect with that spirit of invention that turned two bicycle mechanics in Dayton, Ohio into the fathers of aviation — that same tinkering ingenuity by which some of the most profound innovations of the last millennium were made. And in so doing, in many ways, I’m returning to my roots. I want to be a person of doing, not simply a consumer.